The new organ for Peachtree Road United Methodist Church is the culmination of over four years of planning and building. Discussions began at an early stage in the planning of the new Sanctuary to ensure that the instrument suited the building and the use to which it would be put. Initial proposals suggested an organ spread round a semicircular Apse. Later a single centrally-placed case was envisaged but it was felt that this was at odds with the desire to make the marble mounted Cross a focal point of worship, which lead to the unusual design of two asymmetrical cases. It was also assumed that the organ would have electro-pneumatic action but, as the design developed, it became evident that tracker or mechanical action would be a possibility and preferable because of its longevity and superior musicality. 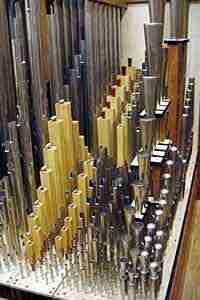 The result is an unusual design for an organ, but one well-founded in the requirements of the liturgy and sound organbuilding practice. The left-hand case contains the Great, Swell and Choir divisions on mechanical action. 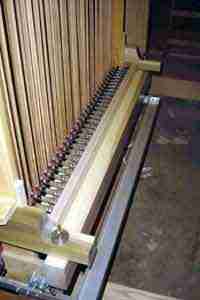 The right hand case contains the Pedal Organ also on mechanical action and the Solo Organ which employs electro-pneumatic action, the pipework being on higher pressures. The console is detached, set in the Choir stalls on the left hand side. This has given rise to one of the longest tracker runs ever. The manual trackers run horizontally 5.5 metres (18ft) before they reach the organ, and the Choir trackers then rise 9 metres (almost 30 ft) to the Choir soundboard. The pedal trackers run 10 metres horizontally (33ft) before reaching the Pedal case. The couplers are mechanical, although optional electric coupling will be provided for use when required, the mechanical coupling remaining the default option. Detailed design work commenced early in 2000. By the middle of that year, manufacture of components and pipework had begun, and the construction of the casework was begun early in 2001. Towards the end of 2001, most of the components of the instrument were nearing completion, and the first shipments were made early in 2002, after which the lengthy installation process in the church commenced. As the cases were erected, more containers arrived with components to be installed; and by the beginning of June the technical installation was complete. At this stage, work began on making all the various parts of the organ become a musical instrument, the voicing, which took a further four months to complete. 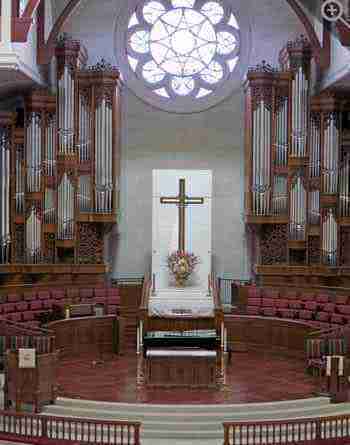 Designing an organ for a church with a lively and varied musical programme such as that at Peachtree Road is a challenging task. 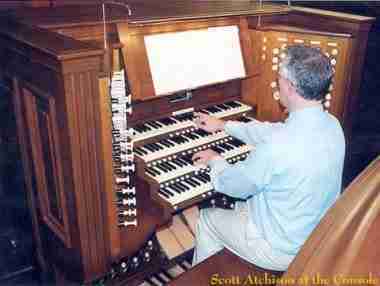 After lengthy discussions with the organist, Scott Atchison, a specification was agreed which addresses those diverse requirements. The cornerstone as always is the Great Organ, a complete division with independent Principal and Flute choruses and mutations, topped by two mixtures and three chorus reeds. The secondary chorus appears in the Swell Organ, also a large division containing the softest sounds on the organ but also able to create the wonderful "caged rage" effect of the best romantic Swell Organs of the Classic American organ. 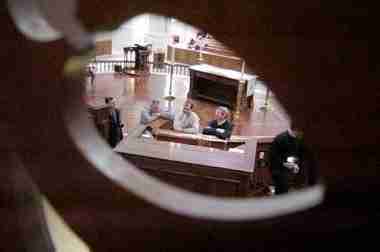 A view of the Mander Team in January 2003 visit to Atlanta, photographed from inside the organ. 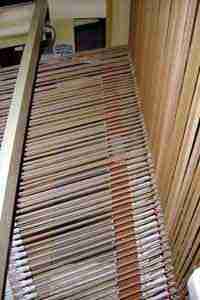 The Choir Organ is an interesting department, as it is required in some respects to fulfil three rôles. Firstly, it provides the more gentle enclosed division so necessary for the sympathetic accompaniment of the singers. Secondly, it has the tertiary chorus often demanded in the organ literature and it also has a solo rôle providing some of the more idiosyncratic sounds one expects of an enclosed Solo Organ. The fourth division is the one which provides the crowning glory to the instrument. It has three unenclosed Bombarde reeds at 16, 8 and 4ft pitch which, whilst considerably more powerful than the Great chorus reeds, are nevertheless closely related in style. In addition, the Solo Organ has a Tuba and a Trompette Royale, this latter mounted horizontally on the wall of the gallery at the opposite end of the church. The Pedal is also remarkably complete up to a five rank mixture (containing, unusually, a Tierce in its composition) and no less than six reed stops. Behind the case stands an open wood Diapason 32ft, which fills the church with the deep bass sound, the first time such a stop has been made for a new Mander Organ. The console reflects the ethos of the instrument, based on the sumptuous consoles built by the great Classic American organ builder E M Skinner. The instrument is designed to be highly versatile, capable of producing musical performances of a wide ranging organ literature, from the Baroque to the modern day French, German, English, Spanish and, of course, American. If our aim to make the organ truly versatile is successful, the organists will spend many years exploring its tonal capabilities and they will still be discovering new tonal attributes a decade from now. Olivier Messiaen, Louis Vierne and Max Reger. 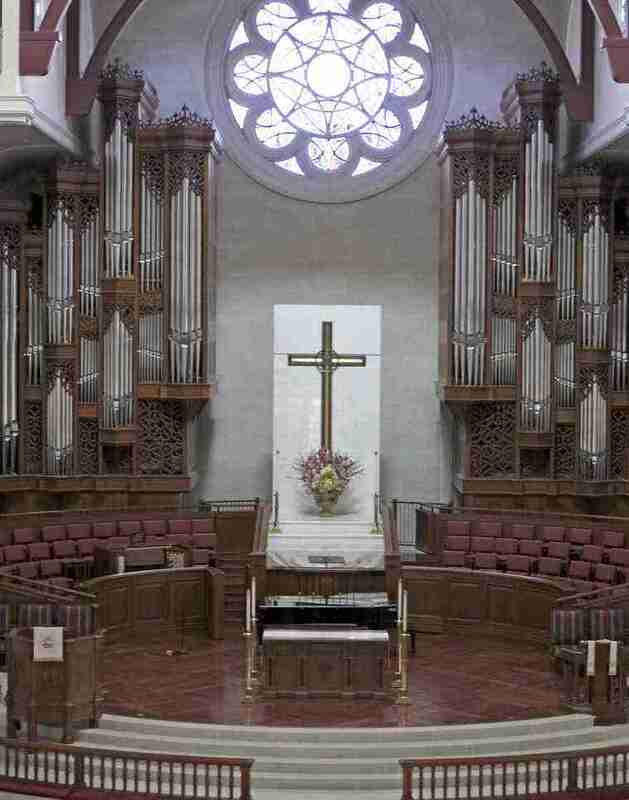 View the Specification of the Peachtree Road, UMC organ (completed 2002) and pipe scales.